A cast iron, timber or brass antique bed can add charm and character to your bedroom. Whether you are an antique furniture collector, home maker, parent or part of an exclusive resort, B & B, boutique or period hotel wanting a bed or beds we have the perfect bed for you. 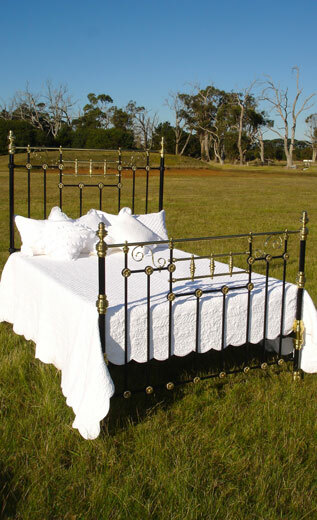 The “Antique Bed Specialists” specialise in supplying and restoring genuine antique beds, antique cast iron beds, antique iron beds, antique brass beds and antique wooden or timber beds. We also stock a range of antique furniture that complements our range of beds. These beautiful genuine antique beds are available in all sizes with great care taken in extending them to Queen and King to maintain there original authentic antique appearance. We received our new brass queen size bed and must say we are very impressed with the end result. It has met our expectations and thank you very much for your restoration. It will be something we will treasure and I’m sure the kids will be eyeing it off for many years to come. Thank you so much for the superb job you have done restoring our beautiful bed. It has exceeded our expectations and is truly magnificent!! Absolutely love the bed head restoration you did for us.We had so much fun picking it out as our wedding gift and has become an instant family heirloom.The bed is absolutely gorgeous and we receive many compliments on it. Thanks again.